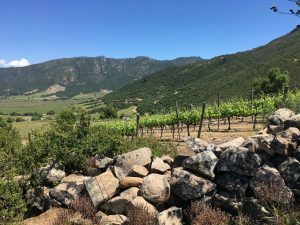 Tour Host Jenny Siddall shares some of her thoughts and experiences of the exciting wine regions of South America. A unique landscape featuring fascinating wine and food awaits the more intrepid wine traveler. Jenny has been traveling to South America for many years and will be leading up our trip to Chile & Argentina in November. My first trip to Argentina and Chile was in 2003. I fell in love with the dramatic landscapes, the glaciers, volcanoes and the Andes which we explored in the day time. At night we would go out to a restaurant to devour a well earned meal and uncork a new wine or two and taste different styles and wine regions. With such exotic names (many wines are named after the stars, for example Sideral, Alfa Crux, Caelum) it wasn’t enough for me to just taste these wines. 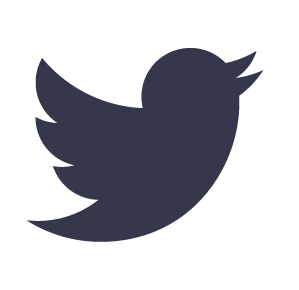 Curious by nature, I wanted to know where they were made and what made them the way they were. That inspired my first wine trip to Mendoza and Chile in 2011. I was awed by the spectacular setting of the wineries with the backdrop of the snow capped Andes. Malbec and Carménère are certainly the star grapes but I was also interested to taste many little heard of grape varieties such as Ancellotta and Caladoc in Mendoza and to learn about the País grape in Chile and the passionate wine makers behind the MOVI (Movement of Independent Vintners) that promote small scale producers in Chile. Since then I have been back every year to guide wine tours and also trekking and cycling tours and always long to get back to taste the wines over a long lunch! An Argentine Asado (more cuts of meat than you ever thought existed, barbecued over vine trunks) and the irresistible empanadas (delicate meat or mozzarella pasties) paired with various wines in one of the fantastic restaurants located within the wineries is an experience not to be missed! In the 18th century a Chilean vine nursery was set up and many vine cuttings were imported from Bordeaux. The Merlot cuttings brought over had been confused and were in fact Carménère. The resulting wines were found to be fresher and more aromatic with notes of blackcurrant leaf and black fruit. Thanks to this happy mistake, Carménère was saved from extinction as Oidium and Phylloxera proceeded to eradicate the variety in France. Prior to its arrival in Chile, Carménère was used as a blending variety but in Chile it shines as a standalone variety and today is the country´s emblematic grape variety. 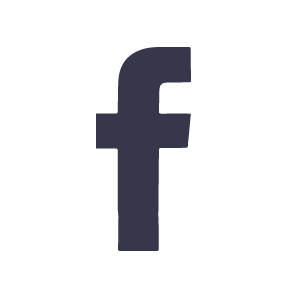 Some of the country´s finest Cabernet Sauvignons, Merlots, Carménères and Syrahs are made in Colchagua. The Colchagua Valley spans the width of the narrow country, from the Andes to the Pacific. Tucked within the valley is Apalta, a horse shoe shaped range of mountains. The neat rows of vines are framed by the surrounding mountains and are picture postcard perfect. Here the wines are fresh, elegant and structured. Imagine sipping a glass of wine under the canopy of vines at one of the winery´s top restaurants. The Aconcagua Valley lies 100 kilometres north of Santiago and nestles in the foot hills of the Andes mountains. The Aconcagua valley gets its name both from the Aconcagua river and from the highest peak in the Andes. At 6,961 metres (22,838 ft) Mount Aconcagua is the highest mountain outside of Asia and lies just over the border in Argentina. The vines are surrounded by avocado plantations planted sky high in pyramid like terraces. Cabernet Sauvignon, Merlot, Cabernet Franc and Carménère are blended here to make the iconic Bordeaux style blends. Two Chilean wines came first and second in the famous Berlin Wine Tasting in 2004, when wine experts carried out a blind tasting of premium wines from Chile, France, and Italy. The San Antonio and Casablanca Valleys are bordered to the west by the Pacific ocean. The vineyards benefit from the cooling morning sea fogs that roll in from the Pacific’s icy, inky blue sea that the poet Pablo Neruda wrote so many poems about. This makes it the perfect place to grow cool climate loving grape varieties such as Pinot Noir and Sauvignon Blanc. Fresh ceviche made from a meaty white fish called Corvina or Talapia is the perfect dish to pair with a deliciously crisp, aromatic glass of Sauvignon Blanc. 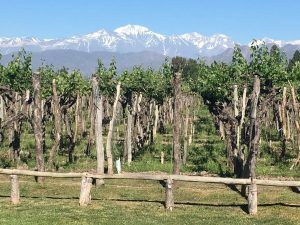 The Mendoza province is a green oasis, nestled at the foot of the snow capped Andes. The acequias or irrigation channels that transport the snow melt water to the vineyards and the city were constructed by the native Huarpes. They are still to this day what make it possible to grow vines in such a harsh environment that otherwise would be a desert. Indeed the locals are quick to explain that in Mendoza you don´t buy land. Instead you buy irrigation rights. Mendoza is home to Malbec. Originally from France, Malbec or Cot as it is known in Cahors, is king and has adapted to its new high altitude home. Think of a glass of juicy, ripe red and black fruits which is the perfect accompaniment to the Argentine Asado or BBQ. Meat like you´ve never tasted it before! Mendoza is made up of three distinct wine regions: Maipú, Luján de Cuyo and the Uco Valley. At the end of the 18th century, Maipú and Luján de Cuyo were the first areas to be planted with vines. The area was settled by European immigrants, many who came from wine producing areas in Europe. Many Italian, Spanish and French grape cuttings made the long journey over with them and prospered in the ideal climate of 300 days sun a year and only 10 days of rain. In 1993 Argentina´s first Controlled Appellation was created for Malbec and many of the traditional wineries are located there. 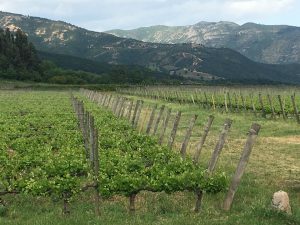 Further south, the Uco Valley with vineyards at over 1,200 metres (3,937 ft), has hot day and cool night time temperatures. 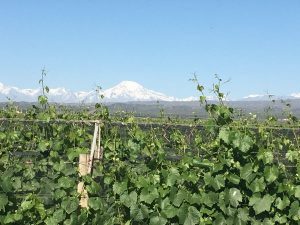 The big temperature difference allows for the grapes to ripen by day and for the high natural acidity to be retained at night. 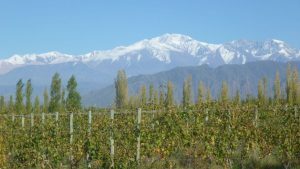 Growers will usually protect their vines with hail nets in an attempt to shelter the grapes from the wrath of the mighty Andes which dwarf the vineyards. 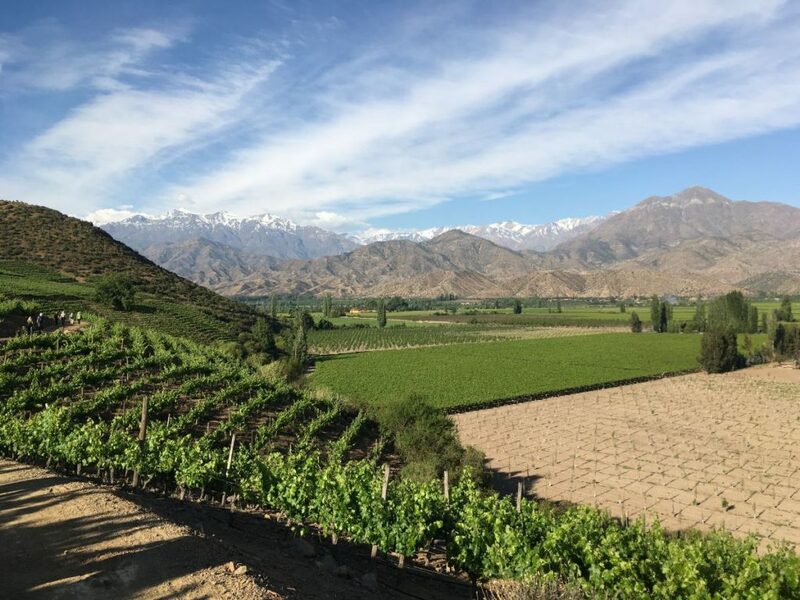 At first, vine growers were thought to be crazy to plant in such an extreme location but nowadays their efforts are paying off especially for their Malbec, Chardonnay and Cabernet Franc wines. Cafayate is located in the north of Argentina in the Salta province which shares its borders with Bolivia. Think of a dramatic mountainous red landscape dotted with cacti taller than houses as a backdrop, interspersed with the intense green of the vineyards. The little known Torrontés grape here steals the show. Often confused with the Spanish variety Turruntés the star of the show in Salta is actually a cross of two grape varieties: the perfumed Muscat of Alexandria and the native American Criolla Chica, which is also known as California´s Mission grape or País in Chile. Locally nicknamed the “liar” the wine is perfumed and sweet on the nose but deliciously crisp with mouth watering acidity, finishing with a hint of bitter grapefruit. Delicious as an aperitif or with the Salteño speciality, Humita (corn) empanada pastry parcels.